1 AIA LU/HSW; 1 GBCI CE Hour; 1 AIBD P-CE; 1 IACET CEU*; AAA 1 Structured Learning Hour; AANB 1 Hour of Core Learning; AAPEI 1 Structured Learning Hour; SAA 1 Hour of Core Learning; MAA 1 Structured Learning Hour; NSAA 1 Hour of Core Learning; OAA 1 Learning Hour; NLAA 1 Hour of Core Learning; NWTAA 1 Structured Learning Hour; This course can be self-reported to the AIBC, as per their CE Guidelines. Discuss how current design trends paired with sustainable material selection can help specifiers create healthier buildings. Explain how specifying sustainable materials for interiors contributes to occupant well-being. List the ways that sustainable ceiling and wall materials can contribute to healthier building interiors. Describe how new industry standards and transparency are driving quieter, sustainable, and more comfortable interior spaces. Recent trends in green building design and product selection focus on sustainable and energy-efficient materials and how they can impact and improve architectural performance and occupant experience. Both performance and occupant experience are extremely important when designing for interior spaces, where most people spend an estimated 90 percent of their time. Architects, designers, and builders as well as green building programs understand the importance of choosing the right products for the space. But there’s more to it than that. 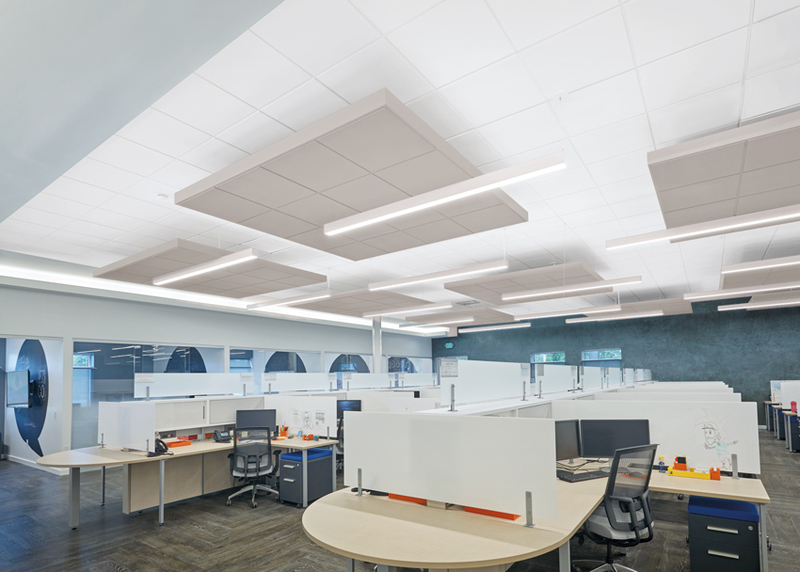 Healthy interiors start with healthy products, such as certified sustainable ceiling and wall panels, as shown here at Brandstar corporate headquarters in Deerfield Beach, Florida. This growing shift toward an emphasis on the health and well-being of occupants is now closely tied to sustainable building practices that use environmentally friendly materials and products, and in particular increased product ingredient transparency. Architects and designers have many options when it comes to specifying materials, and product transparency can help them make choices best suited to their project requirements. The driving forces behind the trend include new ideas about how spaces are used, deliberate attention to how spaces impact the productivity and health of occupants, and increased transparency about product ingredients and related certifications. Together, these trends provide that architects, designers, specifiers, and building developers all have opportunities to rethink not only the products they use but also how to use them. The millennial generation has had a huge impact on reshaping interior spaces in the workplace. Where previous generations relied on closed office spaces and cubicles, new workers emphasize the benefits of nontraditional, flexible workspaces that include anything from open-plan areas for collaboration to kitchens, lounges, and recreation areas. Workplaces specifically designed for open-plan, focus, or collaborative spaces can lead to unwanted noise, which is a leading factor in workplace dissatisfaction, and can reduce effectiveness and increase stress of building occupants. In addition to a shift to more open interior design options, sustainability has become a true driving force with building design. Manufacturers, developers, architects, designers, and building owners all have a goal to create buildings that are energy efficient and sustainable, and that do more to improve the occupant health and well-being compared to more traditional designs. Balancing these sometimes competing priorities can be challenging at times with so much information available. 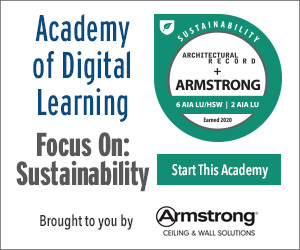 Product transparency and third-party certifications help streamline relevant information in a way that makes the design process more manageable and helps architects be confident they’re choosing sustainable materials for their projects. Where we previously relied on anecdotal evidence about the impact of interior lighting, air quality, and noise on occupant experience, we now have a growing body of scientific evidence that supports what people have known for a long time: indoor environments affect human health. From a designer’s perspective, this means that healthy interiors can positively impact occupant experience. The challenge is that the upfront investments can be costly, and the return on investment (ROI) isn’t immediately apparent to potential building owners and property managers. But that view is starting to change. Many businesses and organizations are becoming increasingly aware that it takes more than just a “good job” and a positive work culture to hire and retain good employees. One of the most common shifts is a general understanding that well-designed workplaces and healthy environments have a tremendous impact on employee satisfaction, productivity, and ultimately retention. Evidence shows that employees who work in spaces that are light, bright, quiet, and thermally comfortable are more likely to perform better than those in spaces that are lacking those positive qualities. And performance is a metric that organizations can use as evidence of their investment. Businesses that recognize how important healthy workspaces are will be more likely to invest in new building designs and certified healthy and sustainable products to create better work environments. Buildings designed with the occupant experience and well-being in mind can make a huge difference in improving tenant and occupant satisfaction. Product transparency and certifications help specifiers choose sustainable products that can improve occupant well-being and create better spaces. Integrating sustainable materials into a building design starts with a shift in how specifiers think about and understand the space. This shift parallels an overall cultural shift toward wellness that is founded in evidence and relies heavily on having key stakeholders value wellness as a core element of the design. 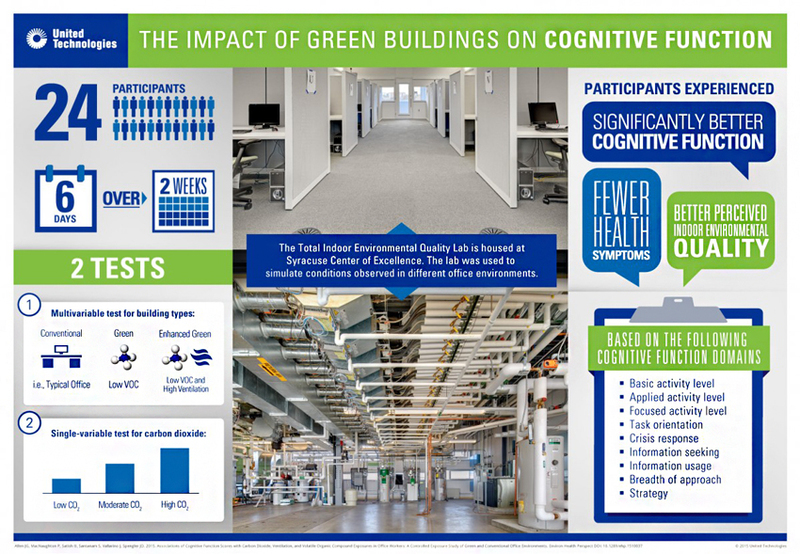 Healthier building design is an up-front investment that can reap significant rewards for building owners. Tenants, whether commercial or residential, are increasingly willing to pay a premium for buildings that are environmentally sustainable and that promote health and wellness. 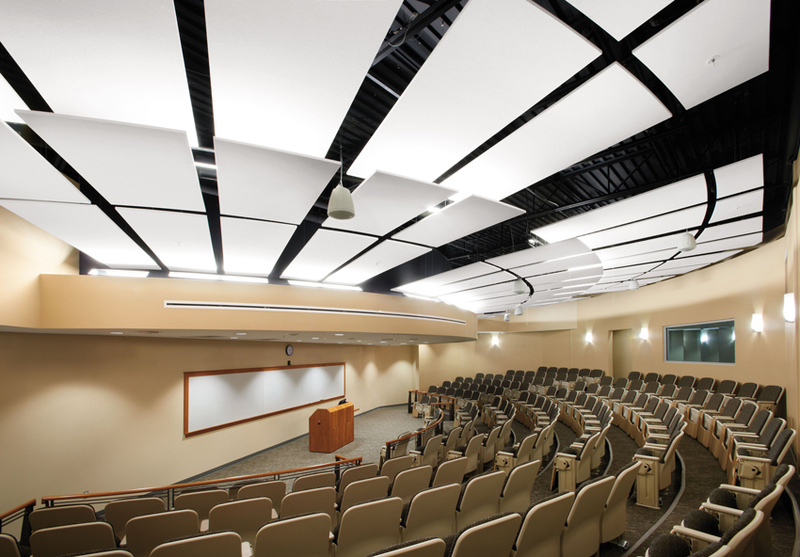 Architects and designers can choose flexible design solutions that incorporate ceiling panels to enhance an interior space, as shown here at the University of New Hampshire School of Law in Concord, New Hampshire.